BOUCHERVILLE, QC, Oct. 17, 2011 /CNW Telbec/ - Today, in the presence of Clément Gignac, the QuebecMinister of Natural Resources and Wildlife and Minister responsible for the Northern Plan, Pierre Moreau, theQuebec Minister of Transport and Nicole Ménard, the Quebec Minister of Tourism and Minister responsible of the Montérégie region, Claude Robert, President and CEO of Robert Transport, and Sophie Brochu, President and CEO of Gaz Métro, announced the inauguration of the first commercial liquefied natural gas (LNG) fuelling station inCanada along the "Blue Road." This station is an integral part of the LNG pilot project designed to fuel a fleet of heavy-duty trucks. The purpose of the "Blue Road" is to create Canada's first liquefied natural gas-fuelled freight transportation corridor along the 20/401 highway between the Quebec City area and the Greater Toronto Area. Every week, heavy-duty trucks make 48,000 trips along this corridor. More specifically, the project aims to replace diesel fuel with the cleaner alternative that is liquefied natural gas (LNG). In partnership with the Quebec government and Robert Transport, Gaz Métro Transportation Solutions (GMTS), a subsidiary of Gaz Métro, hopes to establish the technical and economic feasibility of LNG as an alternative fuel for a major fleet of heavy-duty trucks, even in Quebec's harsh weather conditions. Accordingly, Gaz Métro will make use of its liquefaction plant that has been operating in Montreal for more than 40 years. Three cryogenic storage tanks will supply the LNG for three refuelling sites located in Boucherville, Mississauga and the Quebec City area. 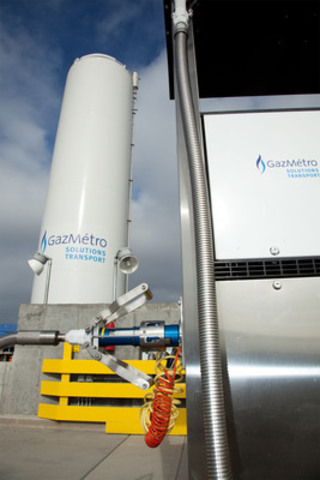 "Gaz Métro Transportation Solutions is dedicated to coming up with energy solutions that can be immediately applied in the transportation industry. 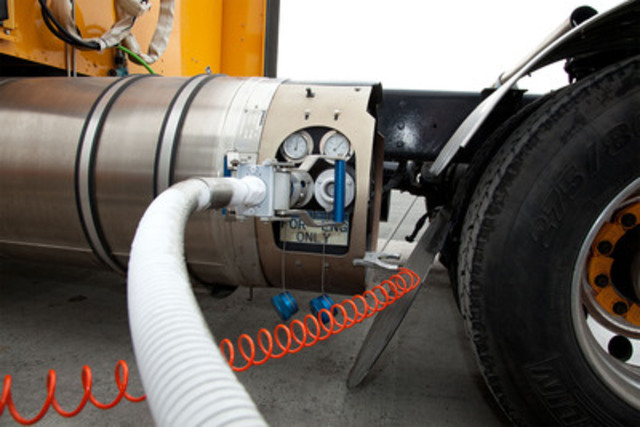 Natural gas is a forward-looking environmental and economical solution for the trucking sector. We are proud to contribute to the adaptation and development of a new technology in Quebec," said Sophie Brochu, President and CEO of Gaz Métro. Natural gas-fuelled transportation has even more promising longer-term prospects. Vehicles that run on natural gas can use processed biomethane, a renewable natural gas generated by organic waste valorization. The use of biomethane could help reduce GHG emissions by roughly 85%, when compared with diesel.